This opinion piece by Lisa Finaldi originally appeared in The News & Observer. For the original, click here. Ask a three-year-old what she wants to be when she grows up, and the answer is just as likely to be superhero or mermaid as it is veterinarian or engineer. But inside that preschooler’s brain, a foundation is being built that will play a large role in determining her future school and career success. That’s because during a child’s earliest years, his or her experiences are built into the body, shaping the architecture of the brain and creating the foundation for future learning and health. In fact, the early years are so defining that by the time a child turns eight, his or her third-grade reading outcomes can predict future academic achievement and career success. Decades of research show that strong brains are built when three key factors fall into place: health and development is on track from birth; families and communities are supportive and supported; and children have access to high-quality birth-through-age eight learning environments with regular attendance. Across North Carolina, schools, policymakers, and community and business leaders are recognizing the importance of investments in young children. And the majority of North Carolina voters across the political spectrum want the state to double its investment in early childhood development. The momentum is building, and North Carolina has already taken great strides. One piece of the puzzle that’s missing? Workplace supports for parents. Family-friendly workplace policies such as flexible schedules, paid parental leave and support for breastfeeding mothers at work have a direct, positive impact on child health and well-being, especially during the critical early years. And families aren’t the only winners. Family-friendly employers benefit, too, by attracting and retaining more talent, improving productivity and boosting employee morale. Despite these positive outcomes, many current employer policies are based on an outdated model: a two-parent household, with one parent who stays at home to care for children full time, which fits only nine percent of all families today. That means the vast majority of families must work in a system that was created for a bygone era, and parents are struggling to balance work and family needs. • 75 percent of mothers and 50 percent of fathers have passed up work opportunities, switched jobs, or quit to care for their children. • Nearly 40 percent of parents say they’ve left a job because it lacked flexibility. • Half of North Carolina employers had difficulty hiring in 2018, up 10 percent from 2016. And a record-low 3.6 percent unemployment rate and an ongoing skills gap means employers must work harder to attract and retain top talent. These trends can also negatively affect career attainment of parents with young children, especially mothers. Over the past year, the North Carolina Early Childhood Foundation (NCECF) has gathered input from more than 1,000 employers throughout the state about what family-friendly workplace policies are currently offered to North Carolinians; what employees want from family-friendly benefits; what employers would like to offer; and what the challenges are to doing so. Overwhelmingly, we’ve found that NC employers care about workforce development and attracting and retaining top talent, and they recognize that family-friendly benefits can help meet workforce needs now and in the future. They just need a little help figuring out how to get started to implement new policies in their own workplace. 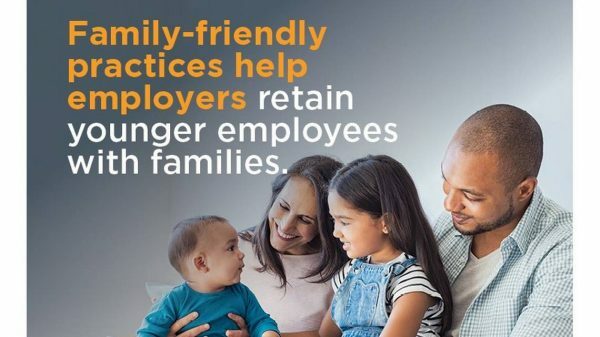 That’s why earlier this week, we released the Guide to Family Forward Workplaces as part of Family Forward NC, an initiative to create more family-friendly workplaces across the state. The guide, informed by our research and an advisory council of prominent business leaders, community leaders and health experts, provides tools for employers of all sizes with practical tips for selecting and implementing 16 family-friendly workplace practices that have evidence to support positive business impact and a positive effect on child health and well-being. Family friendly benefits are an essential business strategy in the competition for talent, and employer supports for parents and their children are an essential component to the overall health and well-being of North Carolina’s children – our state’s future workforce. It’s a win-win.